← Are the Crafting Coupons Changing Your Shopping Behaviour? 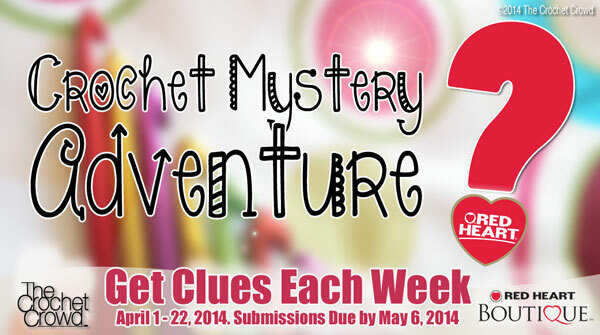 Crochet Mystery Adventure begins April 1st, 2014. I’ve been busy filming up tutorials and preparing for this mystery challenge. The mystery crochet along will last 4 weeks with each Tuesday being another launch of clues (some of the pattern). Red Heart Yarns has been gracious enough to allow us to use one of their patterns that hasn’t been released before. It’s a brand new pattern! Your first clue will be released on Tuesday Afternoon at 2pm EST, April 1st, 2014. Clues will be on on Apr 1, 8, 15 and 22nd. You will have until May 6th, 2014 to send us an email with a photo of your finished project. If you get our newsletters, you will be notified first and have it delivered to your inbox. You can add yourself to our newsletters by simply signing up here. Let’s have fun and the adventure begins April 1st, 2014. See you then! This entry was posted in Crochet Challenges and tagged 2014, April, Challenge, crochet crowd, Mikey, Mystery, Red Heart. Bookmark the permalink. I just got my eyeballs in the mail today! 😜 Super excited to begin! I am in Australia, and would love to take the Mystery Project on – BUT what ply yarn are you using, as I don’t think they sell Red Heart over here? I want in! Are the clues going to be just posted here or e-mailed to us? Eyes, stuffing – – sounds like something like a stuffing critter with eyes. I am going to have to do this one. I have a great granddaughter due this summer. Hope it will be something I would love love to make for her!!! Can’t wait to start! Sounds like a lot of fun. I will be participating. Can’t wait. I will be adding this mystery item to my website http://www.nanascrochetshoppe.com Thx!! Will the clues be emailed to us or will we need to come to the blog to see them? Ha ha ha…… You’re so sneaky! I’m looking up the eyes on amazon but they don’t come in inches, only mm. How many mms for an inch? Can I use one main color and for the accent colors can I use my scrap yarn? Or does it need to be just the three colors? Sounds like fun!! Can’t wait for the clues to be posted! i want to join also , think its allot of fun. this will be my first challenge to participate in, can not wait, pretty excited! think i might try this it will be fun. Is this something a beginner can do? It’s not in the guidelines as there is no cost to sign up… You don’t need to register to participate. Mike, this sounds like a lot of fun. Thanks for doing this. I’m looking forward to seeing all the entries. I do not like the safety eyes. Is it ok to use googly eyes? Soooooo excited! You are so much fun Mikey! They are called shank eyes. I found them online at Joann.com for less than $2.00! Julie – what size eyes did you buy from Joann.com? The size in inches is not listed but according to Google 1″ = 25+ mm. I am wondering if you ordered the 20mm eyes? Thanks! if I use the g hook how many stitches or what is the gauge for this project. This information will be given when the project is launched. I’m ready. Let the games begin!